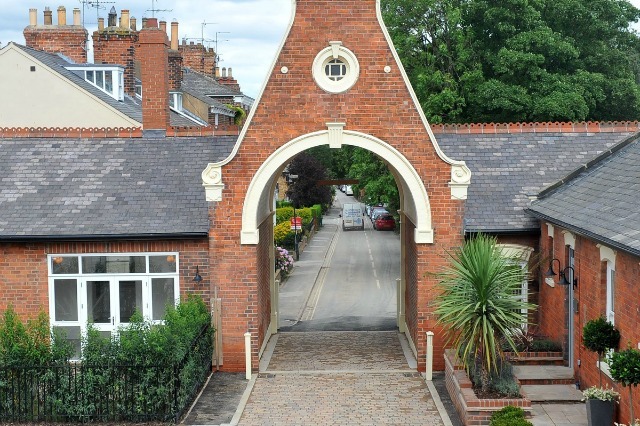 If you fancy living in an 'exclusive' development in Beverley, then this is your chance to snap up one of 55 new properties. However, if you have a large and messy family, you should know that ownership comes with an unusual rule: you won't be allowed to hang your washing out. The Hull Daily Mail has reported that the developers, PJ Livesey Group, are concerned that it will 'detract from the Victorian legacy of the buildings', which are on the former Beverley Westwood hospital site. Presumably they're not keen on people airing their smalls and lowering the tone of the area either. Anyone who buys a house or flat in the development will have to sign a contract stating that they won't hang out washing in a way that will "detract from the visual enjoyment of the building". The properties, which start at £349,950 for a three-bedroom house, will come with a washer and dryer - to encourage people to spend the money on drying their clothes in a more aesthetically pleasing way. They also feature a number of other usual rules to protect the look of the area - including demanding people have a specific kind of shed, and that they don't park caravans or trailers on the driveways. It's not the only development that comes with unusual restrictions. Plenty of property companies add what are known as Restrictive Covenants, which insist that long after they have sold, certain rules have to be obeyed. The rule about caravans and trailers is a relatively common one, and a few developers have added in rules that say anyone repairing a car at the property must do so behind a screen. Bournville, the village originally built for Cadbury factory workers on the outskirts of Birmingham, has some of the most famous rules - enforced by the Bournville Village Trust. Buyers cannot erect satellite dishes, play loud music, replace their picket fence with a hedge, paint the garage door another colour, or leave the grass to grow too long. Satellite dish rules are in place in a number of areas, as are restrictions about the colour of the front door - and in some cases rules about the colour the entire property can and cannot be painted. Occasionally solicitors come across some very specific rules - including properties where rubbish bins must not be kept somewhere they can be seen from the street. But what do you think? Do you mind rules like this? And would it put you off buying a property? Let us know in the comments. Choo choo! This railway station house, near Welshpool, has lovely views over the surrounding countryside. It's currently laid out with a kitchen/breakfast room, sitting room and bedroom on the ground floor with a living room, bedroom and bathroom on the first. Outside is a two-storey signal box with power and lighting. It costs £225,000 from agent McCartneys. It's tucked underground like an animal's lair, and has the name to match: Walnut Burrow. Near Rickmansworth, the four-bedroom eco-house boasts a cinema room and bespoke German kitchen. It's built around a central courtyard with a spiral staircase to the garden on the roof. It costs £2 million through agent Savills. This sweet little toll house in Berwick-Upon-Tweed is small but perfectly formed, with just a hallway, living room, kitchen, bedroom and bathroom. Outside, there's just space for two small flowerbeds. But the rooms are large and bright, and the price is great - just £129,950 through agent Rettie. This Yorkshire bungalow looks conventional enough at first glance, but it's actually built from straw bales - "well insulated and cosy," say the agents. It consists of a lounge area with wood burning stove, kitchen area, two bedrooms and bathroom. There's room for extension and outline planning permission for a further two-bedroom bungalow. Near Driffield, it costs £169,950 from agents D Dunk Lewis & Graves. Once the control tower for RAF Wainfleet, this building near Boston, Lincolnshire currently looks rather forbidding - but could transform into a house of which the Thunderbirds would be proud. It consists of a four storey control tower, along with four detached buildings which once served as kitchen, rest room, gym and offices. The owners are looking for £300,000 to £350,000 through agents William H Brown. This extraordinary apartment in Manchester takes up the clock tower of St Georges Church and spans nine - yes, nine - different levels. Fortunately, there's a lift. It has three/four bedrooms, three receptions rooms, a gym, sauna and roof terrace (with battlements) and is stuffed full of interesting architectural features including stained glass windows. It costs £1 million through agents Jordan Fishwick. This one-bedroom cottage near Papa Westray, Orkney, is perfect for anyone that really wants to get away from it all. It has beautiful sea views from its 11 acres, along with a couple of outbuildings. Inside, it's been modernised and has wood floors and a wood-burning stove. Lows Solicitors are looking for offers over £90,000. More of a Tardis than a boat, this 78-foot Dutch barge comprises a 24-foot reception room, separate, well-fitted kitchen and utility area and two good-sized en-suite bedrooms. It's moored at London's St Katharine Docks, where mooring fees are £14,312 a year. It's being sold through Riverhomes for £220,000. The Addams family would love this eight-bedroom Gothic mansion in Crystal Palace, south-east London. It's packed full of original features, from elaborate architraves and windows to an ornate staircase and a belvedere. Amazingly, the attic space has been transformed into a mock-up of a spaceship for children. It's available through Hamptons International for £3,250,000. This tiny but delightful cottage in Cornwall is packed full of original features: stone floors, beams, old doors - the lot. It's one bedroom is a double, and there's a small courtyard garden at the rear. It costs £159,950 through agents Bond Oxborough Phillips.